Adolph Wilhelm Krasnapolsky arrived in Amsterdam in 1856 where he, following the footsteps of his father and grandfather, begin working as a tailor. After a busy day’s work, he sought relaxation in an old coffee-house in the Warmoesstraat. It was long and narrow, with wooden benches and tables where Loots, the owner, and his waiter August Volmer mostly served beer. Adolph forged a firm friendship with Volmer and his sister Johanna, who became his wife in 1862. Four years later, he persuaded the tailor to buy the ruinous coffee-house from the owner. 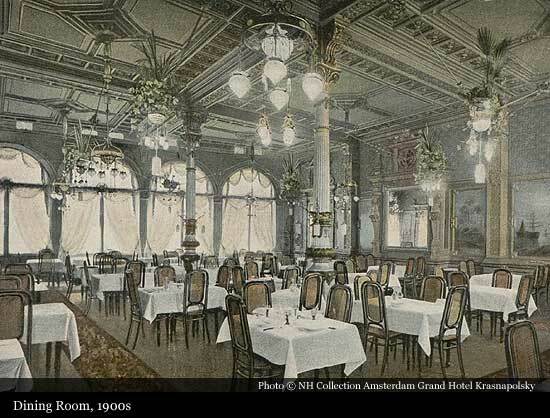 Not long after, Krasnapolsky bought the coffee-house and named it the “Nieuwe Poolsche Koffijhuis” (The New Polish Coffee- house). With the help of August and his three sisters Johanna, Wilhelmine and Mathilde, he started to run this property. 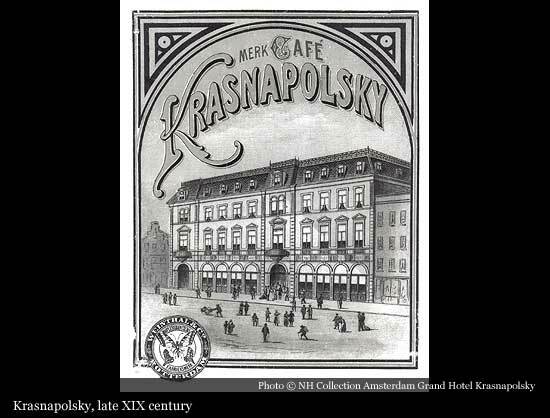 In 1870, Krasnapolsky bought a second building, next to the coffee-house in the Warmoesstraat, and connected it to the business. Café Krasnapolsky was born! Krasnapolsky saw excellent opportunities for expanding his business; he bought 39 run-down premises, which he immediately demolished. 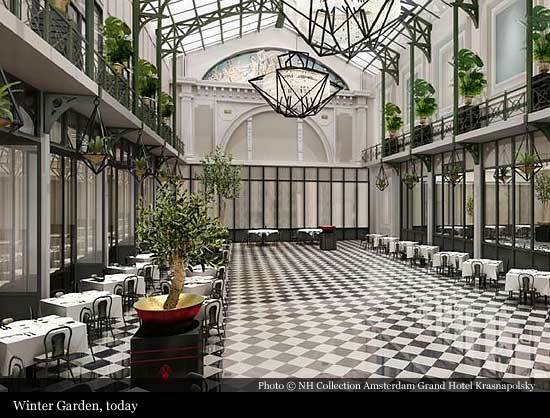 The cleared ground measured around 4000 m2, on which he resolved to build a restaurant complete with Conservatory, Reading Room and a Billiard Room. He approached the, in that time renowned, architect Gerlag Salm to draw up plans for his design. Krasnapolsky bought building after building, carrying out numerous renovations. By 1874, the turnover from the restaurant was that high, that Krasnapolsky could build his own abattoir in the Servetsteeg. The construction of the Winter Garden came with financial support of four partners. A month after the opening of the Winter Garden, Krasnapolsky applied for a permit to set up two steam generators in an adjacent warehouse to improve the air cooling system. 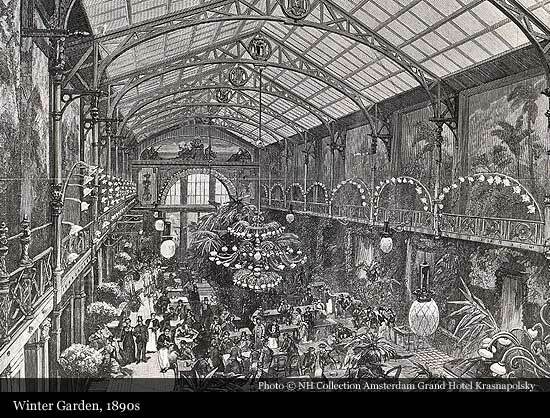 The switch from gaslight to carbon lamps lowered the temperature in the Winter Garden. In April 1881, Krasnapolsky began to generate electricity with his own two steam generators; he bought the properties at the Servetsteeg for his own power generator. The hotel, having already 125 rooms, opened its doors on 14 June 1883. All rooms were equipped with steam heating, which made both hot and cold baths possible for the guests. Also, the hotel was equipped with all kinds of modern equipments, as telephones for example. The biggest sensation was an indoor tropical garden, the Winter Garden. The other side of the garden was bordered by a gracious Conservatory; the rear wall could be removed in the summer, creating a balcony to the Summer Garden. The Winter Garden was a great success. In 1874, King Willem III’s 40th year as monarch was celebrated there, as was his marriage in 1879 to Princess Emma. After Adolph died in 1912, Hotel Krasnapolsky continued its existence. With the Second World War came an influx of uninvited guests that were to stay in the Netherlands for five years. 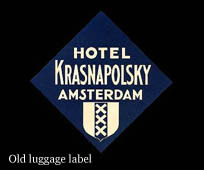 However, Hotel Krasnapolsky was not requisitioned, and continued to open its doors to all-comers. Also, in the last months of the war, spring 1945, from the hotel illegal news was circulated throughout the neighborhood. 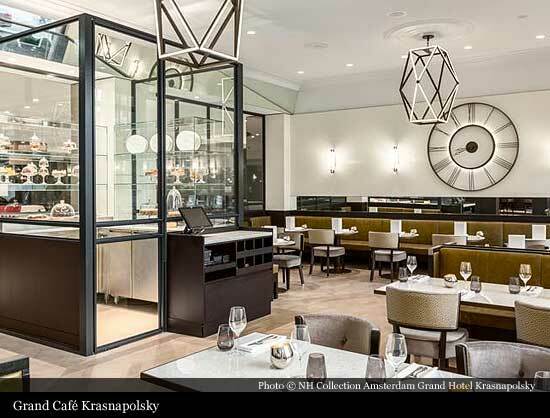 Thanks to the mix of tempting hotel facilities and extensive conference amenities in the heart of the Dutch capital, the Krasnapolsky won itself a name among international conference bureaus. This all started in 1950. The polmanshuis, located directly on the Dam, had been a good neighbor to the Krasnapolsky for years. Fusing this into one major hotel restaurant was an ambitious plan. With a loan totaling almost 2.1 million guilders, the Polmans Wing was built, providing 105 beds. 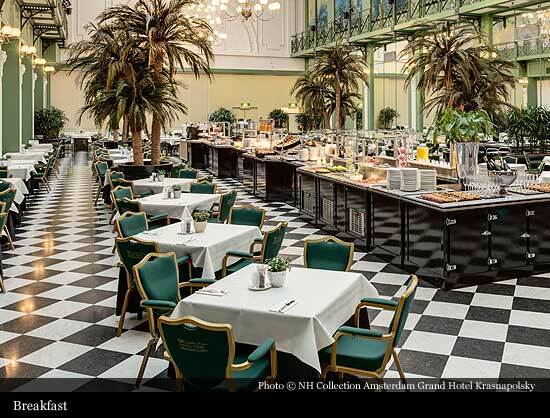 In 1951 hotel is known as the Grand Hotel Krasnapolsky. In May 1952, a long-cherished dream came true. 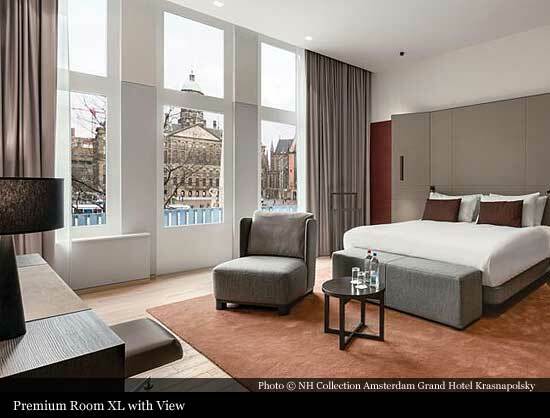 With the renovation of the Polmanshuis, Grand Hotel Krasnapolsky was finally located on Dam Square. 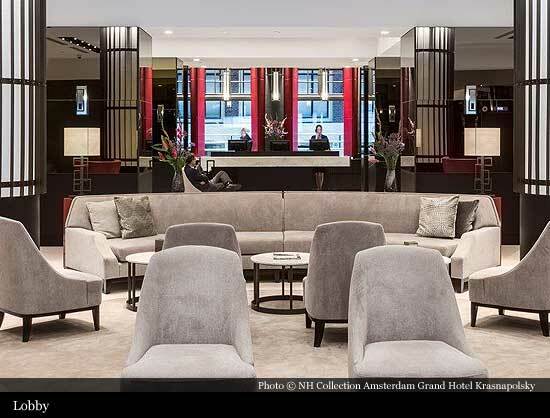 Grand Hotel Krasnapolsky was again one of the best hotels in Amsterdam. In January 1958 Grand Hotel Krasnapolsky licensed to rebuild the complex yet again. The extension created a conference room for around 600 people on the ground floor (The Grand Ballroom), two smaller conference rooms on the first floor and another 80 rooms (St. John’s Wing). Constructions began in 1959 and were to take about twelve months. When the St. Jan’s Wing was ready, three new conference rooms had been created. Also new rooms were built. In 1961, a temporary billiard room was relocated in the basement of the St. Jan’s Wing. 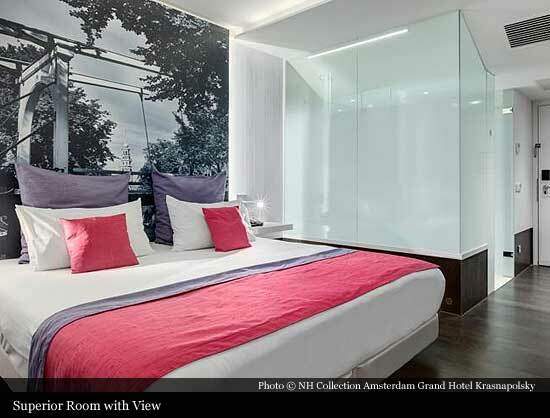 In 1968 was the opening of a parking facility for 150 cars and in the Sint Jansstraat a new hotel wing with 120 beds was opened (St. John’s 2). In the early 1980’s the next building was opened, the Court Wing. 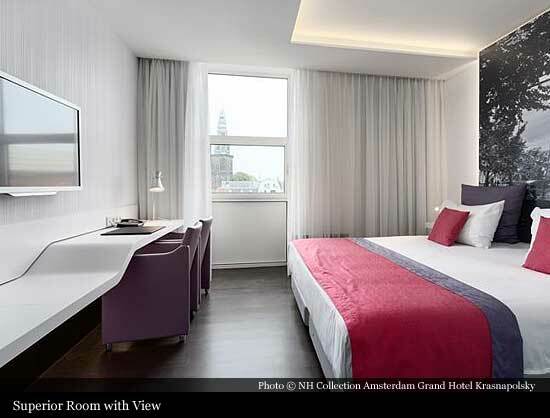 Around 1990 Grand Hotel Krasnapolsky is the only conference center in Amsterdam where guests can also spend the night. In 1991, Grand Hotel Krasnapolsky gets the opportunity to buy the buildings of the Salvation Army, which are located next to the hotel. In 1995, four years after the rebuilding commenced, another 108 rooms were added to the complex with the construction of the new hotel wing, the current Royal Wing. In 1996, 36 fully furnished luxury apartments in a number of renovated historical canal houses close to the hotel were attached to Grand Hotel Krasnapolsky. In 1997, Grand Hotel Krasnapolsky was taken over by the Golden Tulip hotel chain. 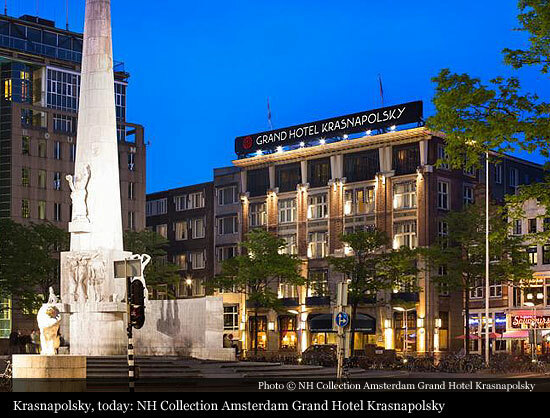 When NH Hotels took over Golden Tulip in 2000, Grand Hotel Krasnapolsky became part of this Spanish hotel chain.